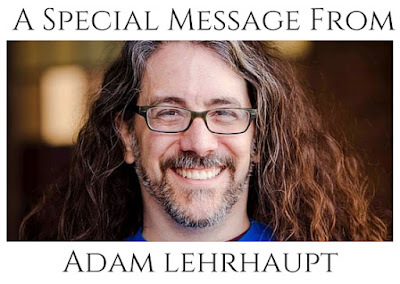 Author Adam Lehrhaupt hasn't visited Watch. Connect. Read. since August 23, 2013! 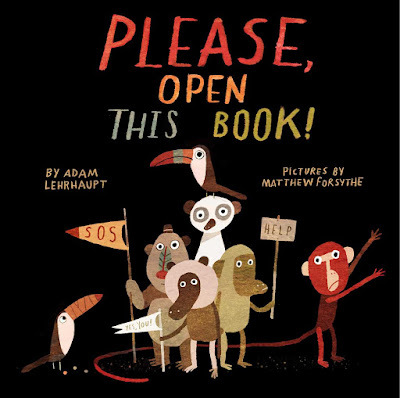 I'm thrilled he agreed to come back to share the book trailer for his hilarious picture book, Please, Open This Book! Thank you, Adam! Hi Mr. Schu! And howdy to all the wonderful kidlit folks out there! It’s Adam Lehrhaupt, chatting to you from the awesome digs here at Watch. Connect. Read. I am SUPER excited to share the trailer for my next picture book, PLEASE, OPEN THIS BOOK! I am once again teamed with the FABULOUS Matthew Forsythe and the great folks at Paula Wiseman Books/Simon and Schuster Books for Young Readers. PLEASE, OPEN THIS BOOK! comes out on October 6th! It may even be available as you are reading this! That is SO COOL!!! The award-winning creators of WARNING: DO NOT OPEN THIS BOOK! are back with another zany monkey adventure—and this time, it’s the MONKEYS that need your help! In PLEASE, OPEN THIS BOOK!, it is up to YOU to save the desperate group of monkeys trapped between the pages. This irresistibly entertaining rescue effort puts power in the hands of the page-turner, and giggles into everyone! Sounds fun, right? So now, without any further ado, or monkeying about, I am overjoyed to present the trailer for PLEASE, OPEN THIS BOOK! Thanks for taking a peek. Hope you liked it. And remember, don’t be a book closer! Trailer credit: Richard Strauss: Also Sprach Zarathustra by Kevin MacLeod is licensed under a Creative Commons Attribution License.